Can you even believe that we are on the brink of fall? You may be already feeling a chill in the air and seeing golden leaves on your sidewalks. Here in Florida, we’ve had two mornings this week that dipped low enough for us to know the dog days of summer are ending but it will be a long time before the temps drop enough to pull out hot tea and sweaters. And yet we’re only two weeks from October. Wow! I so appreciate you reading along here at True and Faithful; I appreciate your comments and emails. And I want to let you know about a new series I’m excited to launch in October. Starting October 1st, I’ll be writing a 31 day series called Braving the Broken. What do we do when life shatters? How do we get back up on our feet and walk out a life that’s broken? I can tell you that in the four years since Dan has died, my heart has been broken and reshaped. Part of what God has done is to give me a heart to encourage and proclaim with every breath I have that God is faithful. Every single day, I wish that Dan was here with us and there are still plenty of moments when the missing is huge and the void is so apparent. When our life collapsed around us four years ago, I needed to know that hope wasn’t just for eternity. I needed hope this side of heaven and I pretty much needed a fresh infusion every day. I needed to know that we could walk through the pain and that we would see joy again. On the mornings when despair threatened to keep me in bed, I desperately needed God’s truth to plant my feet. We all do. Glance around at your friends and neighbors and you can easily see that life dishes up some hard. Right now I have several friends going through such difficulties and these friends bubble to the top of my thoughts in the quiet moments. I can pray for them and that’s a good thing, but the flesh in me wants to make it right. I want the pain to go away and for it all to be fixed. But the spirit in me has learned that God pervades the hard spaces and that walking out our trials and suffering with God is actually best. If we allow it, we will hear Him more, see Him more and learn more of Him in the hard than we ever did when life rolled along comfortably. That’s what we’ll explore in October. We’ll look at how to anchor a broken life in hope and some very practical steps for walking through trials and suffering. We’ll look at how to adjust to the change that difficulties can bring, I’ll share the resources that have helped me the most in the last four years and so much more. First, sign up with your email to have each day’s content delivered directly to you. You will be able to access the posts on the blog but each weekend in October, I’ll send out to those on the email list a beautiful Bible verse that can be printed and framed. 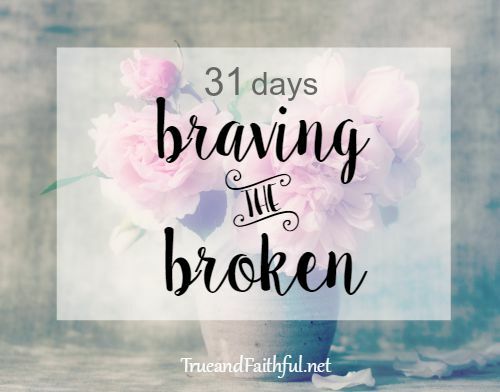 You can sign up for 31 Days: Braving the Broken here. Second, if you know someone who would benefit from this series of Braving the Broken, will you share this with them? Invite them to join us. I pray that God will use this series to move us forward and closer to Him. *You can also join this community over on the Facebook page for more encouragement. Day 3: Free Printable Scripture for You! Day 14: $500 DaySpring Shopping Spree Giveaway! I found you through Pinterest and I’m super excited but the link to sign up isn’t working for me. Sarah, I’m sorry the link isn’t working for you. I’ve checked to make sure the link is up but if it still doesn’t work for you, let me know. Thank you and I’m happy you’re joining us! Can’t wait for the new series. Thank for you and allowing God to use your deepest, darkest days to help others. Only God. Love you, Lisa! Glad you are joining us Bethany! Andrea, I don’t see your email in the signup. I”m happy to add your email to the list if you’d like. Hello Lisa. As I was reading how you say walking out our trials with God is actually best, it made me think about the quote I saw by John Ortberg the other day which reads: “If you ask people who don’t believe in God why they don’t, the number one answer will be suffering. If you ask people who believe in God when they grew most spiritually, the number one answer will be suffering.” Praying your 31 days will reach lots of women. Wow, Rachel, I love that quote. And it is spot on. Thank you for sharing! The same thing stuck out to me, it is so wonderful to hear someone who has been through a trial say that suffering with God is actually best. It boosts my faith and gives me hope that I will be able to weather the storms of life with my Savior as well. Thank you Sarah for kind words. This sounds so amazing, Lisa! I am signing up and hoping to forward the pieces to a friend in need. Thank you Sheila! Glad to have you here. Thank you Susan I know you’ve walked through this as well and know the hope that Christ brings. Wow – I am so glad that I clicked through to your blog. I can not wait to read more of your series for write 31 days. Our trials have looked really really different but I know that our Big God is so faithful in the middle of our broken places. Can not wait to read more. Faith, I’m glad you’ll be joining. Yes, we have a faithful God. I did add you Andrea. The first post will go out tomorrow. Please let me know if you don’t get it. So much hope this side of heaven, Carol. Glad you’re here. I am so glad to have found you! My husband passed away in January and I’ve been feeling like I’m the only one writing about brokenness, loss, and living with courage! Looking forward to reading your words this month. Becky, I felt that same way. I’m so glad you’re here as well and I pray that the posts this month will be some balm for what you’re going through. Praying for you even as I write this. So glad I decided to click this button in the linky to find out more! I’m eager to follow along. I’ve braved my own brand of broken and am so thankful for people who are willing to share their own stories so I can learn and grow with them. What a great topic! Looking forward to reading more! Thank you Joy for joining us! Hello. Excited to start following along here with you. Love how this challenge is pushing us to write freely & beautifully! I’m glad you’re here Brittany! Hats off to writing all month. Lisa, what a neat series. And very brave of you to write. Your post here makes me think of one of my favorite Bible verses: PSalm 30 verse 5 “Weeping may come for the night, but joy comes with the morning.” I hope that you are starting to see some joy in the midst of your grief and sadness. My post today is all about finding God’s grace in the midst of sadness. God is a gracious merciful loving God which I am so very thankful for. May you too be blessed by God’s grace and goodness! Blessed to be your neighbor at Tell His Story today! Thank you Tara for visiting. I love that verse and have prayed it in anticipation over our family. What a beautiful 31 days of hope! I am praying and believing that God will minister to the hearts of many through this series! What an inspiration you are! When I read about what you have been through, my heart sinks and I can’t even imagine that pain. My husband has been diagnosed with panic/anxiety and a lot of times he feels like he is going to die. The panic causes his heart to skip beats and he worries that it’s something more than panic. So sometimes I feel fear that He will have something happen to him and I will be left with raising 4 kids on my own. But I know that no matter what happens God gets us through. I look forward to reading how God helps you endure through your grief. Thank you for using your pain to help others. I just discovered your series. How inspiring. Thank you very much for sharing. Very timely. This is what my prayer is all about today. I came across this on Pinterest, now several years later from when the series occurred. It looks like the links for some of the days aren’t posted. Is there a way I might still access the whole series? Thanks in advance for your consideration.